Celebrities get free advanced samples of cool stuff all the time -- but it's not often they're accused of stealing secret ingredients and selling them as their own!!! Kate Hudson is being sued by a hair care company, accused of enjoying a soon-to-be-released secret volcano ash hair product so much -- she got together with a bunch of people and released their own line of volcano ash hair products. 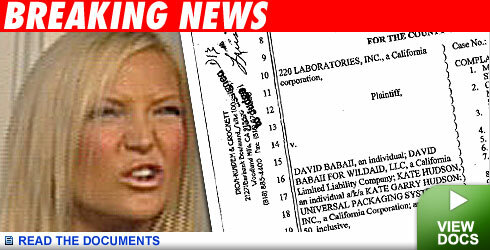 The lawsuit, filed Friday in L.A. County Superior Court, claims she even hawked the product on HSN. The plaintiffs -- an outfit called 220 Labs -- are gunning for unspecified damages. UPDATE: Kate's reps issued the following statement: "Kate and her attorneys are only just learning of the complaint, as Kate has not yet been served. Kate does not know the plaintiffs and has never met with them or spoken with them. Her representatives believe that the claims are baseless and without merit and intend to vigorously defend the lawsuit."